Three years ago, APRL scanning services got a major boost with the installation of a book scanning station purchased by the Mighty Buck Club. This allowed us to reduce the price for our scanning service, provide a scanning station for library visitors at no charge, and digitize books and journals. The book scanner has been so popular that there is often a wait to use it. 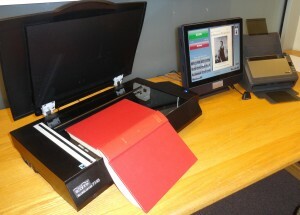 Thanks to a grant from the David T. Beals III Charitable Trust, we have purchased a second book scanner for the library. 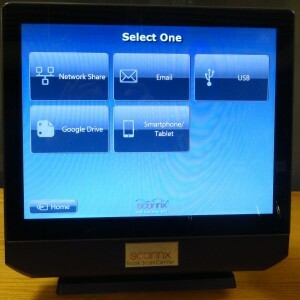 The new scanner is similar to the first scanner, but has faster hardware and an enhanced interface. We have upgraded the first scanner to this new interface, too. Great news. I’m bringing the rest of the Bayless files this summer. Read the notice the night before I went to the APRL. Was very pleased to find the scanner in good working order. It is quick and easy to use. You should take your own flash drive to which you download. I had my computer and borrowed their flash drive to download into my notebook. Worked fine.